One of the things you quickly learn about when you are an educator is the astonishing amount of old technology that is in use at schools and colleges throughout the nation. When it comes to quality products of business and education, our experience with portable devices has taught us one thing: look for Optoma products. Optoma is a world renowned manufacturer of projectors, audio products, video equipment, and home entertainment systems. Headquartered in Fremont, CA, the company pioneered the use of Texas Instruments’ DLP technology to produce high quality images and conserve quality over a lifetime of product use. 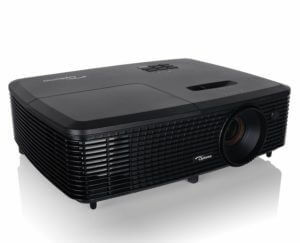 Here is our Optoma S341 Review, the latest projector from the renowned brand. When it came to a choice for a projector, we recommend to go for the Optoma S341 for three reasons: first, the company’s impressive warranty offer of 10,000 hours lamp life. The second factor is the fact that this projector is light enough to carry around at under 5 lbs. Lastly, this is the one projector that comes with a built in speaker and connects wirelessly to other devices – a huge plus if you ask us. One of the things we feel everyone using a project wants is to hold the attention of everyone in the audience. Whether it is a classroom, large hall, or conference room, we feel the projector can make or break the impression of the presenter. The first impression is the last, and that is especially true in the world of business. Regardless of where you use this projector, we guarantee S341 will be the center of attention even when it is off. Straight out of the box, it looks impressive with solid construction. The S341 model offers full 3d coverage for content, making it the ultimate choice for interactive videos. Again, we find this particularly useful in classrooms, but we do not see why this can’t be carried on for business presentations, watching movies, or even gaming. The days of scrambling around for a separate audio device are gone thanks to the built in speaker. You don’t need to mess around with extra wires and look for another power supply either, everything you need is right there. The folks over at Optoma are known for using some innovative imaging technology. We can honestly say, the performance of the Optoma S341 adds a new kick to normal images and makes colors come to life on the screen. Here are another couple of features we found really useful. The Auto Off feature allows users to set a certain time limit after which the device will power off. No reason to worry about reconnecting wires or reconfiguring anything, because the S341 comes with a quick resume option too. This allows the projector to be instantly powered on. 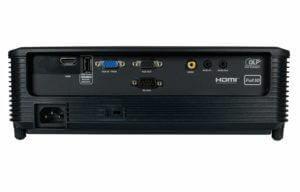 Overall, the Optoma S341 has many useful features and highly affordable for a best presentation experience. The model has good built-quality, feels durable and easily portable. If you’re looking for a good quality projector for a reasonable price, we recommend to give it a try.